Normally when I’m brewing with an element that I haven’t used before (a strain of yeast, a new adjunct or specialty malt, etc), I try to find out as much info as I can about other brewers’ past experiences with it. With this Belgian pale ale though, we were experimenting with a cultured strain of yeast from the Bruery where such information was basically non-existent. Overall, I think it turned out alright though. It’s not necessarily my favorite beer, but the flavors are enjoyable and the balance between sweet, bitter, and spice are just about spot on. It’ll be great in the warmer months of summer and I’ll look forward to revisiting it again then. Appearance – Very clear with a color somewhere between a dark golden and amber. The thick, white, rocky head faded relatively quickly, but the mild foamy bubbles stayed on the surface and clung to the glass through the last sip. Aroma – Solid malt nose and toasted grain with a bit more clove and spice than I was expecting. No hop aroma whatsoever. Taste – I’m getting a lot of grainy/biscuity malt at first, bordering on too much for my own preference. Next time, if I were to brew this recipe again, I think I’d cut the biscuit addition in half. There is a nice sweetness up front that I like with this style, but it’s not over the top and it’s balanced well with a clean, smooth bitterness on the finish. I like the spicy yeast phenolics, but for a pale, they might be accentuated a bit too much. Although it’s very, very mild, I’m also picking up a slight orange fruitiness. 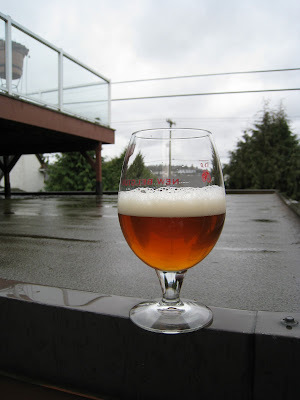 Mouthfeel – Even with such a low final gravity, this beer had a nice medium body. No alcohol warmth and carbonation is about medium. I’d probably like a touch more, but it’s not at the point where it’s noticeably low. Drinkability and notes – Overall, I think it’s a nicely balanced beer with a lot of great flavor for the alcohol content. It’s not perfect by any means, and there are things that I would change for next time (reduction of biscuit, possibly lower fermentation temp, etc). That said, I like that it has a lot of the flavors that you typically associate with the higher alcohol blonde Belgian ales, yet is lower in abv and lighter on the sweetness. It’ll be a great sessionable beer for a hot summer day.